Do you dream of winning the lottery or making a killing in the market? Have all your friends and family members retired early from a get-rich-quick scheme? We thought not. 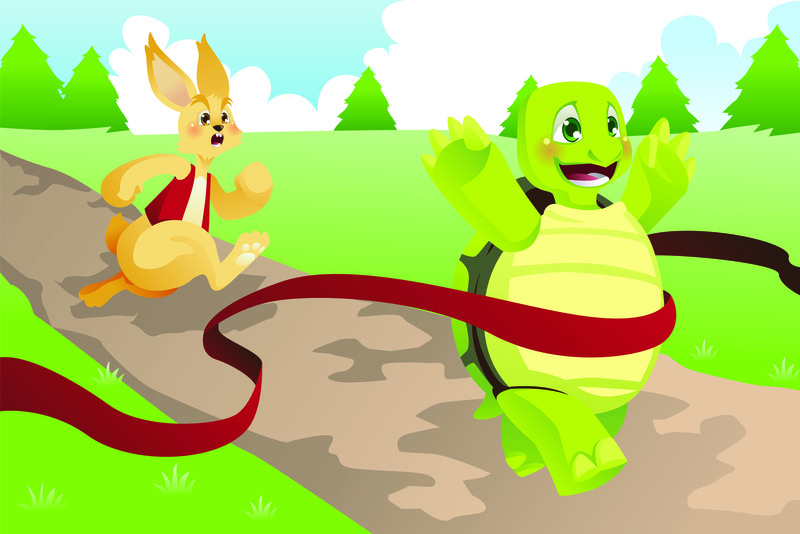 Are you a tortoise or a hare? When it comes to accumulating wealth, slow and steady wins the day. This advice is nothing new, but with pressure to live larger than life and with increased job and financial insecurities, setting money aside from each paycheck can seem like a pipedream. Aesop’s fable contains great advice for today. When it comes to saving money, you should always pay yourself first. Even a few dollars add up over time, and you’ll end up ahead of those who rely on the lottery. If you’re skeptical, we want to show you how this simple concept works. We’re certain that once you catch on to the idea, you’ll place your wager on the tortoise. Of course, you need to pay your bills—and on time to avoid late charges. But the first bill to pay? Yourself! When you pay yourself first, you’ll find ways to reduce your “fixed” expenses. Electric bill. Turn out lights when not in use. Use energy efficient light bulbs. Buy energy efficient appliances. You get the picture. Turn the thermostat down and put on a sweater or sweatshirt. Have an energy review and beef up your insulation. Mortgage or rent. Carefully consider how much a move to a bigger house will cost you. It’s way more than the mortgage payment. Expect increases in property taxes, utilities and insurance. Is bigger better in the long run? Everyone has a dozen reasons for not being able to save. But paying yourself first can overcome every single one of them. Isn’t it time you started setting money aside from each paycheck? It’s a good habit that pays off in the long run. Setting money aside from each paycheck is investing in yourself. When you understand that you are your top asset, you’ll see yourself as your top priority. If you haven’t saved enough for your future or for emergencies, or you haven’t started saving at all, remember the tortoise and take heart. You can win this race. Start small. Start with an amount you won’t miss. Could you set aside one percent of your paycheck? One penny out of every dollar can hardly seem worth saving, but when you see those savings begin to build, you’ll be inspired to save more. Start painless. Rather than bank what’s left over at the end of the month, have your savings automatically deducted from your paycheck. What you don’t have in checking to begin with, you won’t even miss. Now that you’re seeing some gains, start getting creative. Don’t ask yourself where you can cut back. Ask yourself where you could save more. You might surprise yourself! Use your pay raise for savings. If you receive a 1% raise, add that to the 1% you were already saving, and you’ve just doubled the amount! If you haven’t maxed out your 401(k) contribution, put your pay raise there. Always take advantage of your employer’s matching funds! Use financial windfalls for savings, not for fun. If tempted, ask yourself what you did with your last windfall. Be honest. Do you even remember? Setting aside money from each paycheck has a lasting impact. You’re accumulating wealth rather than accumulating stuff. When you’re in your twenties, retirement seems incredibly far into the future. And when you’re running a marathon at the speed of a tortoise, it feels like it will take forever to cross that finish line. Just remember that time is on your side! The more time you have, the more your savings will grow. If you need encouragement along the way, set some interim goals. The closer you get to a goal, the easier it is to motivate yourself to cross the finish line.